My Audio Cutter is a tool that lets users cut audio files into pieces. My Audio Cutter 1.2 was available as a giveaway on January 26, 2017! 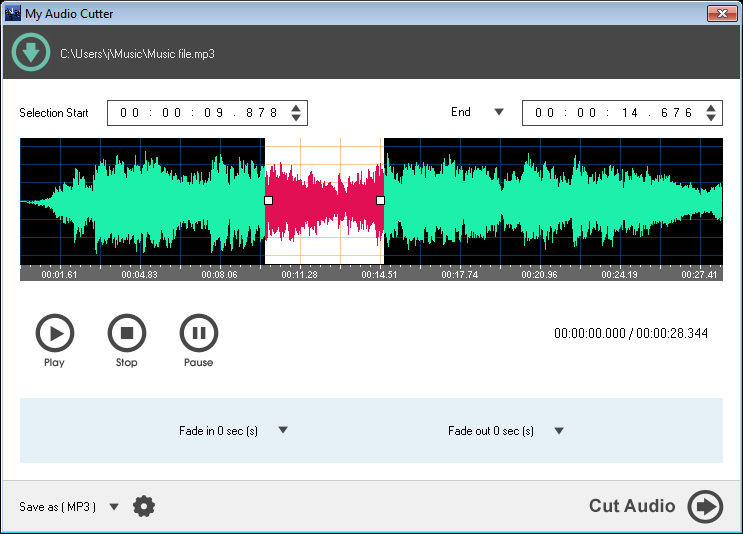 My Audio Cutter is a tool that lets users cut audio files into pieces. The software's interface is friendly and intuitive. It allows you to define in visual or manual mode the start and end time or length to perform the cut. You can play preview the selected segment for better cutting accuracy. It can also add fade-in/fade-out effects to the output audio file. These effects will make the output audio file sound smooth. My Audio Cutter supports audio formats MP3, MP2, WAV, WMA, OGG, FLAC, AIFF, M4A, AAC, AC3, and WV. How would you improve My Audio Cutter 1.2? Allow user to type in the exact cut time. I'm torn - this is a very limited use app - but it's exactly what I needed for something a few years ago. Is it something I'll need again? I doubt it. And if I do, I can just do what I did last time involving 3 small apps. (Why did I not use Audacity as some suggest? Because it's just too huge to get a handle on and I never imagined I could figure out how to do it easily.) So, no thumb up or down from me. I have to be honest here. Who in there right mind would bother using this considering there are so many better free and commercial options out there. Some might say about Audacity that there are limitations, but actually, no there is not if you know how to install codecs you can make it do all this can do and more. For that I must say this one is a sour grape giveaway and give it a thumbs and of no use down. Thank you but no thank you, I don't need clutter on my PC. I have to be honest here. Who in there right mind would bother using this considering there are so many better free and commercial options out there. Some might say about Audacity that there are limitations, but actually, no there is not if you know how to install codecs you can make it do all this can do and more. For that I must say this one is a sour grape giveaway and give it a thumbs and of no use down. Thank you but no thank you, I don't need clutter on my PC. Uninstalled via reboot. The reason I am wiser now is that I once bought a very expensive piece of telephone software off of NCH and when my computer crashed they were not very helpful in getting my $600 software restored. They wanted me to purchase another licence! No thank you on any NCH software. The reason I am wiser now is that I once bought a very expensive piece of telephone software off of NCH and when my computer crashed they were not very helpful in getting my $600 software restored. They wanted me to purchase another licence! No thank you on any NCH software. - Numerous effects including compressor, parametric EQ, reverb, flanger, pitch, reverb, echo, doppler, filters, with a huge range of fine control granularity over each. Effectively, thousands of options. Plus the ability to use plugins, ie VST. Unlike Audacity, Goldwave is not free but does offer nag-ware trial versions. GAOTD - could you persuade Golwave Inc to offer a GAOTD licence? I work with video, and one of the most common issues brides have with their wedding video is abrupt volume changes, for example from added scenic music to, say, the wedding ceremony, or other scene changes. Lazy editing, most common fault, most easily fixed when restoring video, or trying to salvage a poorly produced video. Although not a review per se, my comments are not aimed at deriding GAOTD, or the publisher for making it available; if all you want to achieve is trimming, then this should be a perfectly adequate tool; especially with the ability to fade in/out, avoiding abrupt changes in audio volume. And if there is one tip to offer, it is exactly that; FADE audio tracks in and out, not chop from one to another; it is much easier on the ear! As such, if you don't need the power of Goldwave or Audacity, then this could be the tool for you. I haven't tried this giveaway, simply because - like Audacity - Goldwave can do the same and more. For example: - Import 21 formats and export (save) in 19 formats, with huge granularity over the bitrate, frequency, stereo/mono/ format sub-options, format type - Cut, trim, re-sample, insert silence, stretch/compress; from/to selection, specified time, specified length - Operate on left, right, or both channels (when working with a stereo track, for example) independently - Numerous effects including compressor, parametric EQ, reverb, flanger, pitch, reverb, echo, doppler, filters, with a huge range of fine control granularity over each. Effectively, thousands of options. Plus the ability to use plugins, ie VST. Unlike Audacity, Goldwave is not free but does offer nag-ware trial versions. GAOTD - could you persuade Golwave Inc to offer a GAOTD licence? I work with video, and one of the most common issues brides have with their wedding video is abrupt volume changes, for example from added scenic music to, say, the wedding ceremony, or other scene changes. Lazy editing, most common fault, most easily fixed when restoring video, or trying to salvage a poorly produced video. Although not a review per se, my comments are not aimed at deriding GAOTD, or the publisher for making it available; if all you want to achieve is trimming, then this should be a perfectly adequate tool; especially with the ability to fade in/out, avoiding abrupt changes in audio volume. And if there is one tip to offer, it is exactly that; FADE audio tracks in and out, not chop from one to another; it is much easier on the ear! As such, if you don't need the power of Goldwave or Audacity, then this could be the tool for you. $45 for a audio editor? Uh, no. There are a lot of options out there, Audacity being at the top, that are either a lot cheaper or free. As for todays giveaway, I'm going to give it a try, but there's not a snowball's chance that I'd spend that much money for a hardly used program. Alan, $45 for a audio editor? Uh, no. There are a lot of options out there, Audacity being at the top, that are either a lot cheaper or free. As for todays giveaway, I'm going to give it a try, but there's not a snowball's chance that I'd spend that much money for a hardly used program. Here's hoping Hi Res Audio support becomes intergrated by the majority, before another year pass's. So no DSD support? Here's hoping Hi Res Audio support becomes intergrated by the majority, before another year pass's. I had trouble during installation: I had to pause the firewall. And I did export to 2 different profiles, MP3 and WMA. 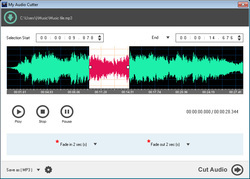 This software will also cut audio parts out of a video file. It's also useful for collecting sound effects in an audio or video file. It would be more useful if it also removed parts in a audio file. While Audacity does the same thing, there is a limit to what types of files that Audacity can output. Ease of use is one I like about this this program. This software will also cut audio parts out of a video file. It's also useful for collecting sound effects in an audio or video file. It would be more useful if it also removed parts in a audio file. While Audacity does the same thing, there is a limit to what types of files that Audacity can output. Ease of use is one I like about this this program. You can input MP4/WMV/ASF video files directly. You can then save the audio of the segment selected. Tested on MP4 and it worked perfectly, not only that it was very simple to use. You can input MP4/WMV/ASF <strong>video</strong> files directly. You can then save the audio of the segment selected. Tested on MP4 and it worked perfectly, not only that it was very simple to use. I think it would be hard to beat Audacity for this kind of operation. And it's totally free all year round, not just on one day. No indication in the description whether it allows cutting of a large file into multiple segments, say ten minutes each - perfect for an audiobook - or if it just deals with cutting out or editing one. Still, the ability to operate with different formats is a good one. Col, no indication on whether it can detect inter-track silences and split an old LP or cassete recording into multiple tracks better than we can do it with say Audacity either. I'm unable to cut more than one sound segment at a time..
Once again, after unzipping, turning off zemana anti-malmare, and turning off my anti-virus, upon installation it goes through the usual GOTD web pages "it's installed - what next? ", there is no evidence at all that the program has actually been installed. Intel i3, gen 6, 128 SSD, 1 Terabyte hard, windows 10, latest update. These has gotten to be a regular occurrence on GOTD. It only happens when the wrapper format is used. This started regularly happening about 1.5 months ago. So much time wasted. Please fix! NOT-INSTALLED Once again, after unzipping, turning off zemana anti-malmare, and turning off my anti-virus, upon installation it goes through the usual GOTD web pages "it's installed - what next? ", there is no evidence at all that the program has actually been installed. Intel i3, gen 6, 128 SSD, 1 Terabyte hard, windows 10, latest update. These has gotten to be a regular occurrence on GOTD. It only happens when the wrapper format is used. This started regularly happening about 1.5 months ago. So much time wasted. Please fix! So many requests like this, so far not a word from GOTD. Anyway this offering does nothing better than many free apps do. arnold, So many requests like this, so far not a word from GOTD. Anyway this offering does nothing better than many free apps do. Don't waste precious time. papin, then it's so much wasted money... so problems not solved sorry. arnold, I had also to pause the Firewall today for an installation. arnold, May have been an omission but you did not say you turned off your Firewall too. GOTD wrapper (Based on Themida techonology 2012, latest update 19-Sep-2016) behaves the same method as malicious rootkits do. It injects "malicious" code to your system. "Rootkit wrappers are very insidious as they use randomly named files completely hidden from Windows, registry addresses and processes all hidden from the Windows OS and hence not visible to your AV, anti-malware or Firewall." In my opinion GOTD should change this wrapper solution, because it is a huge risk to allow ANYKIND of rootkit install on to your system. I quess you have some sort of antirootkit sotfware on your PC even if you have turned off AV and anti-malware. GOTD wrapper (Based on Themida techonology 2012, latest update 19-Sep-2016) behaves the same method as malicious rootkits do. It injects "malicious" code to your system. "Rootkit wrappers are very insidious as they use randomly named files completely hidden from Windows, registry addresses and processes all hidden from the Windows OS and hence not visible to your AV, anti-malware or Firewall." In my opinion GOTD should change this wrapper solution, because it is a huge risk to allow ANYKIND of rootkit install on to your system. I quess you have some sort of antirootkit sotfware on your PC even if you have turned off AV and anti-malware. It may do no more than other free apps but I have it here and now; I don't have to search for an app. GOTD simplifies life, it doesn't necessarily lengthen or enrich it! Can you cite specific examples of potentially harmful files that remain, post-installation ? I'm familiar with the case of WSHelper / ASHelper file structures (from Wondershare product installs, and their array of related companies), with their unacceptable "phone home" behavior, which could prove moderately difficult to remove after the fact. jermin, it isn't based on Themida, it IS Themida. Gene, I use a couple of different paid versions of Wondershare products and have had no problems. Not sure if it 'phones home' or not, but it doesn't seem to cause any problems. I can't think of many software companies that don't have some mechanism for sending an error report or log back to them so that they can try to figure out what went wrong, MicroSoft included. Gene, I use a couple of different paid versions of Wondershare products and have had no problems. Not sure if it 'phones home' or not, but it doesn't seem to cause any problems. I can't think of many software companies that don't have some mechanism for sending an error report or log back to them so that they can try to figure out what went wrong, MicroSoft included.